Gifts in Kind International is the eighth-largest charity in the United States and a global leader in new product philanthropy. They work with thousands of companies, including nearly half of the Fortune 100 consumer, retail, and technology corporations to distribute each year nearly $900 million in new product donations to 150,000 deserving community charities throughout the United States and across the world. In turn, these charities annually help more than 13 million people in need. Gifts in Kind International accomplishes all of this by operating on only 0.3 percent contributions, meaning that 99.7% of all donations go directly to communities and people in need. Click here for further info. John Eldredge has touched the hearts of thousands through his writing and speaking ministry. His messages resonate with people thirsty for a fresh faith and a God who is there. Join us for this special hour of interaction with one of the great voices in the church as he shares specifically with pastors about how to keep your walk with God a vibrant adventure. Join us. Previous teleconferences for downloading can be found at this page. * You've read plenty of books about how to grow your church and "succeed" as a pastor---but how do you juggle the pressing demands of ministry, family, and personal ambition? Explaining seven key challenges to maintaining a healthy, balance, Horner offers stressed-out, stretched-out shepherds seasoned advice for coping with conflicting pressures and reinvigorating their calling! 272 pages, softcover from Baker. Considering all the blood, sweat, and tears that you pour into your ministry, there ought to be a certifiable amount of fruit to show for it, amen? The salient question is, "Is it working?" Beyond the standard, traditional and often misleading numeric attendance trends in your congregation, a perhaps more significant question to pursue is this, "Are people really growing closer to Christ in your church?" The attendance question is easy to determine, but do we really ever know the answer to the "closer to Christ" question? In this video link, Bill Hybels confesses that his own church (Willow Creek), one of the most significant churches in the USA, has had a wake-up call concerning their own effectiveness in helping people to grow in their relationship with the Lord. The title, "The Wake up call of my adult life" says it all. 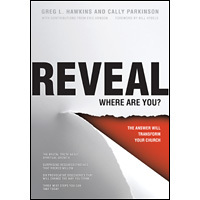 The data in their research is published in book called, "Reveal- Where are you?". It may challenge everything that you have held near and dear. I've just ordered 10 copies for my key leaders; I'm ready to be challenged. How about you? Anyone up for talking about it (Reveal) over lunch? "Ministry is the epitome of free enterprise. When people leave, become dissatisfied or question leadership, we should examine ourselves. We should examine the direction and purpose of our ministry. It is rare that another pastor actually “steals church members,” people leave because they want to. This should be an indicator of the quality and scope of ministry we offer." Dr. James Richards, Supernatural Ministry. (Find it in the Resource Column). Dr. Richards does a stellar job in pointing back to the essential task of clergy; equipping of the saints for the work of ministry. He will effectively challenge you, but not leave you discouraged. You will be inspired, re-focused and empowered with fresh vision.